It is one of the most perplexing mysteries in the world of football. The career of Wayne Rooney is undoubtedly one of the sport’s finest, as he burst into the spotlight at the age of 16 and solidified himself into his country’s record books as one of the most talented and prolific goal scorers to pull on the white jersey of the Three Lions. Ex-England manager Fabio Capello has revealed his desire to take over the managerial reigns at Chelsea. With Roy Hodgson looking at signing a contract extension to take him into the next World Cup, lets look beyond this (as it may not be possible to get too excited before he is gone) to the next potential manager. Here are 5 reasons why it would be prudent to include Brendan Rodgers in the thinking. Ahead of England's opening Euro 2016 qualifier against Switzerland, we discuss whether Roy Hodgson is the right man to take the national team forward. Algeria qualified for the second round of the World Cup for the first time in their history after drawing 1-1 with Fabio Capello's Russia. With the World Cup in Brazil a matter of weeks away, Roy Hodgson will have a good idea of who will be on that much coveted flight to the land of sun, samba and football. Fabio Capello has extended his contract with Russia till the summer of 2018. The 67 year old took charge of the team in 2012. Tottenham's director of football Franco Baldini handed in his resignation after Andre Villas-Boas was fired by chairman Daniel Levy, but the Tottenham board chose to reject the offer from the Italian. Tottenham's stand in manager Tim Sherwood is hopeful that, despite the various names linked with the vacant managerial position at White Hart Lane, he is still in the running to become the club's new manager. Man Utd legend Ole Gunnar Solskjaer is a surprise candidate for the vacant Tottenham job. Solskjaer, who currently manages Molde in his homeland, is eyeing a move to the Premier League. Laurent Blanc is believed to have been selected as the final choice for Paris Saint-Germain’s new manager. It has been reported that the French club have concluded their hectic search for a new manager in the form of Blanc, who last managed France for two years up to last summer’s European Championship when his team made a disappointing quarter-final exit. It seems that the search for a new PSG manager is still far from over. 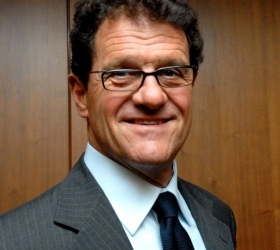 After having been reportedly snubbed by Andre Villa-Boas, their long targeted candidate for the managerial role, it's now Capello's turn to turn down the job offer. Swansea City's chairman Huw Jenkins is keen to settle his differences with present coach Michael Laudrup. In an act of reconciliation with Laudrup, Jenkins has flown to France to convince Gomis' representatives to finalise a summer transfer to Swansea. Andre Villas-Boas has reportedly snubbed Paris Saint-Germain, in favour of staying with Tottenham. It is understood that the in-demand manager turned down the lucrative opportunity to manage PSG, following the exit of Carlo Ancelloti, who is bound to join Real Madrid as a boss this summer. Fabio Capello is the surprise choice to take the Paris St Germain job. The Italian manager had been linked with the role yesterday evening, as Carlo Ancelotti looks set to move to Real Madrid. Roma have confirmed that Franco Baldini has been released from his contract. Fabio Capello's former number 2 will reportedly move to Tottenham this summer where he will become their new sporting director. The FA have refused to comment on reports that Glenn Hoddle has declared his interest in taking the vacant England job. Fabio Capello resigned as England manager in February, and a host of big names have been linked with the role.